Samsung is a name we haven't heard for a long while in screen tech news, and now we know why. 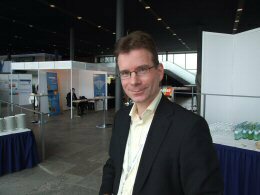 Johan Feenstra, the head of the Samsung LCD Netherlands R & D Center (SNRC), said recently that the screen tech won't be ready for mass production until 2013. Feenstra was a speaker at a digital reading and tablet event in Bussum earlier this week, and that is where he also indicated that they're focusing on larger screens as well, with a 9.7" prototype in the offing. Feenstra has been working with Samsung's electro-wetting screen tech since 2002, long before it belonged to Samsung. The tech was originally developed by Liquavista, a company that Feenstra helped found in 2002. Samsung bought Liquavista in early 2011, and a couple months later relaunched the firm as SNRC. The news today is rather thin, but it's interesting none the less. 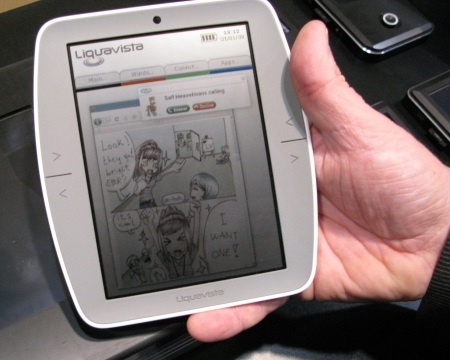 Back before it was bought, Liquavista had planned to release smaller screens in the 6" or so range. Basically they were going after the ereader market. But this was back in 2010 and before. Unfortunately for Liquavista, the price point for the 6" ereader market dropped below what they'd need to charge for their screen. Between B&N and Amazon, you can get an ereader here in the US for under $100 bucks. And the tablet market is almost as bad. While there are 7" tablets in the $400 range, they're all premium devices with hardware costs that leave little margin for a new and expensive screen. So why continue to develop the screens? Well, Liquavista's screen tech is much more energy efficient than LCD screens, even though it's based on similar technology. And the LCD screen on a device is often the biggest battery drain, so if you can replace it with screen that is only half as demanding (Liquavista can do even better), you should be able to significantly extend the battery life. On the other hand, battery life isn't the bugaboo it was when Liquavista was founded, or even when it was bought. It's not unusual anymore to see a tablet with a day or more of usable battery life. By the time that this screen tech actually hits the market, there might not be much of a need for it anymore. Exactly the same arguments apply to Mirasol display technology, but Qualcomm decided to go ahead regardless. Qualcomm is throwing lots of money at the Mirasol screen, but that doesn’t mean it’s a good idea. The Mirasol results so far don’t seem to justify the investment. A 2013 introduction for Liquavista isn’t particularly promising; not with an LCD product already shipping with 266dpi resolution and full-day battery life. Scale back resolution and the graphics to a simple 150DPI product and 15-20 hours will be doable with off-the-shelf tech. With that iPad Retina Display, Apple killed three screens at once: Liquavista, Mirasol, and Pixel Qi. Next! It’s not as if if Apple cooks those things in their basement. Samsung is good either way. They’re supplying that screen right now because Sharp has had problems with its lower-powered screen. Is anyone aware of a display technology that can build a screen where the image area goes all the way to all edges? Someone clue the fanboi into who he’s addressing. I have. It’s not the best experience but it’s doable. It’s the worst I’ve ever head. Reading from white paper in broad sunlight is hard as well… But at least it’s reflected light. I tried to read from iPad on a bus (having a light above me). It’s like reading from a mirror, real bad. I heard Mirasol had problems with view angles. And for some unclear reason only 9.7 is the biggest screen. I do care about battery life, but I’m much more interested in reducing eye strain while reading ebooks. I have a Notion Ink Adam Pixel Chi for that reason, and it is why I am holding out for something like Mirasol or Liquavista, or an improved version of Pixel Chi, before I buy another tablet. So I hope reflective color display technologies find their way into the tablet and ereader markets.